1. 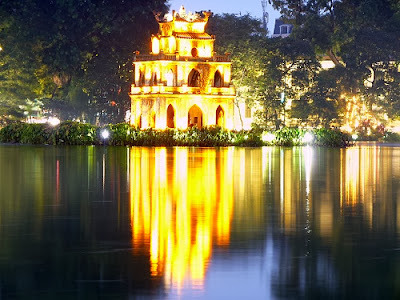 Hanoi - The city of 1000 years culture. French colonial influences still stand tall here, with the city having largely escaped the devastating effects of US bombing elsewhere and left behind colossal mansions and tree-lined boulevards that haven’t changed too much in centuries. The ‘City of the Golden Dragon’ is a commercial hotbed, home to that typically Vietnamese swarm of motorbikes in amongst silk shops, rustic coned hats and market stalls flogging the best pho and rice rolls you’ll ever taste. In amongst it all you’ll find serenity of the reconstructed one-pillar pagoda (the original dates back to 11th century), the temple of literature (where exams determining your job and social rank were once undertaken) and the gruesome Ho Chi Minh Mausoleum, where the former leader is preserved in state in a similar way to Lenin in Moscow. The mausoleum stands in the massive Ba Dinh Square, looking down on a vast grassy field, its pillared façade staring over at a high-flying Vietnamese flag and making for a stark travel experience. 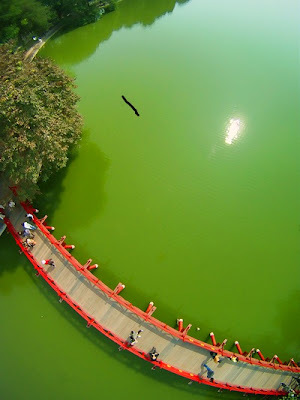 With most Vietnamese travelers being backpackers on a more long term trip, The Perfume Pagoda (actually a striking collection of pagodas southwest of the city) and the stunning ‘image of Vietnam’ that is Halong Bay, with its sharp islands and old-world boats, are also must see (if lengthy) trips from Hanoi. Surprisingly, North Vietnam finds itself frigid – in fact almost icy – in the winter, but nothing can take away from the age-old charm of an Asian city drenched in history, but home to many a modern cultural influence, too. Pull on your pointy hat, grow your beard, and get right in the thick of things. Best time to visit Hanoi and Ha Long bay from October through April (the best), although during the winter months of December, January and February(about 10 Degree C), the weather can be cool and overcast with low visibility due to misty.